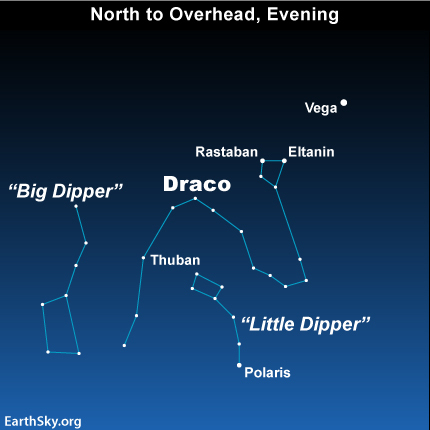 Tonight … if you have a dark sky, make your acquaintance with the constellation Draco the Dragon, starting at nightfall. At mid-northern latitudes, Draco is a circumpolar constellation, meaning it is out all night long every night of the year. Northern Hemisphere summer evenings are the best time to look, because this is when the Dragon’s flashing eyes look down upon you from up high in the northern sky. The chart at the top of this post – showing Draco – covers a lot more sky than our charts usually do. That’s because Draco is big! This serpentine star figure wanders in between the Big and Little Dippers, with its tail found between the bowl of the Big Dipper and the star Polaris. I always notice the two stars in the Dragon’s head when looking at the bright star Vega in the constellation Lyra. If you’re familiar with the Summer Triangle, draw an imaginary line from the star Altair through the star Vega to find the Dragon’s eyes glaring at you from high overhead on July and August evenings. These two stars are Rastaban and Eltanin – lovely, romantic names for the Dragon’s stars. Watch Draco tonight as it circles around the North Star, Polaris. 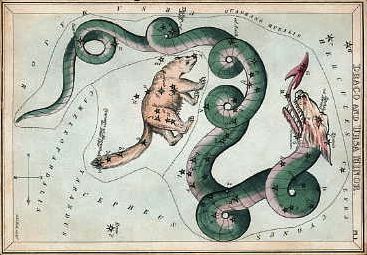 Draco, with Ursa Minor or the Little Dipper, as depicted in Urania’s Mirror, a set of constellation cards published in London c. 1825. Another noteworthy star in Draco is Thuban, which is high in the sky in the evening at this time of year. Thuban is an interesting star because – around 3000 B.C. – Thuban used to be the Pole Star. The constellation Draco, by the way, has been associated with a dragon in many cultures. A Babylonian myth links Draco to the dragon god Tiamat, who was subdued by the god of the sun. Bottom line: Here is Draco the Dragon on a July evening. 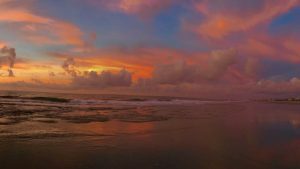 Meet Rastaban and Eltanin – lovely, romantic names for Dragon stars! They represent the Eyes of the Dragon.